I think it's their worst squad in a while personally. Great front row, mixed elsewhere, and importantly not settled. I also think Parra made some pretty shocking errors against Saints, so if he's their form player I wouldn't be too scared. Most of the French teams have had a drop the past few years. Scottrf wrote: I think it's their worst squad in a while personally. Great front row, mixed elsewhere, and importantly not settled. I also think Parra made some pretty shocking errors against Saints, so if he's their form player I wouldn't be too scared. Most of the French teams have had a drop the past few years. Didn't see that game but by on form I meant Para is running the show at Clermont who are topping their pool in the champions cup. I disagree and think this squad is much improved from the Autumn one and a nod in the direction of youth and talent. Will a settled and carefully crafted team like England beat France? Yes I imagine so, but I think there is a great balance in the team and if their prep goes well they may just surprise a few people. Well, Parra seems to take a few steps up in confidence and smugness when he meets Ireland so I always have had respect for him and I never very much liked France when he was one of their conductors on the field. So we'll see. There is something about this newish Ireland though....some genuine promise now in my mind that it is a team that has the ability to cut loose with both power, precision and speed. I've always had a big reservation about the actual impact capacity of our wings in the past. They could do things off and on but I never suspected teams had to do too much thinking about them in preparation. But I've been impressed by the new strain coming through, not just on the wings but at 15 and in the centre... and many of them have made the squad too ...so Joe might have a notion to finally avail of players that want to attack much more than defend. France always shoot their load in their first game at home. Ireland will have to be good. Cant wait for this game, Ill be in the stand. 3 week ban for Mathieu Bastereau a bit harsh? I had a look at the Ireland thread with someone putting their players in 4 categories : world class, international class, below international class and exciting prospect. If I put the French players in the same boxes I might end up with maybe 3/4 world / international class (Guirado , one or two props, vahaamahina, parra. The rest are at best exciting prospect or unproven/below international class (We could argue about Gourdon maybe). Overall it is very young, inexperienced and possibly weak team so I welcome the selection of Parra who has plenty of experience and happens to be the only real leader in this lot so he can make a big difference even if he is less gifted than other French scrummies. All in all it is probably the weakest selection France ever put on a field but it doesn’t mean they cannot be better than the AI one to start with. Good luck to Jacques Brunel as he will need a lot of it if he wants to beat one of the home unions. And unfortunately it is Ireland first, the most settled team in the NH so a miracle is what we expect otherwise no contest it will be. in the last 6 years they've averaged 2 wins (1X3, 4X2 and 1x1). Add to that the particular shambles of their general play and organisation over the last 2 years and I've no idea why anyone would fear them (aside from the usual cliches). Even in averaging those 2 wins they've had some poor performances. being only a drop goal away from losing to Italy, again, for example. I also thought they were absolute rubbish against Scotland last year, but Scotland weren't good enough to take advantage. The loss to England, with England not playing too well, saw them lose and lavished with praise about how "they deserved something out of the game" or the even more blunt, "England didn't deserve the win" (implying France did) conveniently glosses over just how utterly dog egg France were in attack. Of course France could turn around this year, that goes for any team, but I dunno what people are basing it on. Results and performances have been absolutely dire. I suppose this is a good example of how I think we can talk France up, out of some sort of romanticism rather than actual results or performances. Serin was certainly eye catching (not hard with the dirge France served up last year), but I wouldn't have gone as far as to call him good or a revelation. His passing and kicking weren't good enough and given that France play off 9, how utterly rudderless they were reflects badly on him IMO. Collapse2005 wrote: 3 week ban for Mathieu Bastereau a bit harsh? Macalou nearly goes the length of the park @ 1m45s and seems to be a useful lineout operator with a high work rate. Definitely on my "one to watch list" for this 6N assuming he starts. Palis has some good highlights from Top 14 but uncapped so as some have mentioned, unproven, like his ariel and offloading game. Understand the comments above but in terms of balance I think this side is much better. Brunel had to shake things up a bit after last years woeful results under Noves. Expecting good things from them in the 6N this year, that's just my speculative opinion. New coach, much changed squad, I think it's impossible to compare this side with the results under Noves. Wether that translates to results.. ? Serin is not even injured but has been at best average since the start of the season while he was largely inconsistent last season as well. He is still young though so no doubt we will see more of him in the future. It looks like the non test match against New Zealand has proved pretty influential in some of these selections. 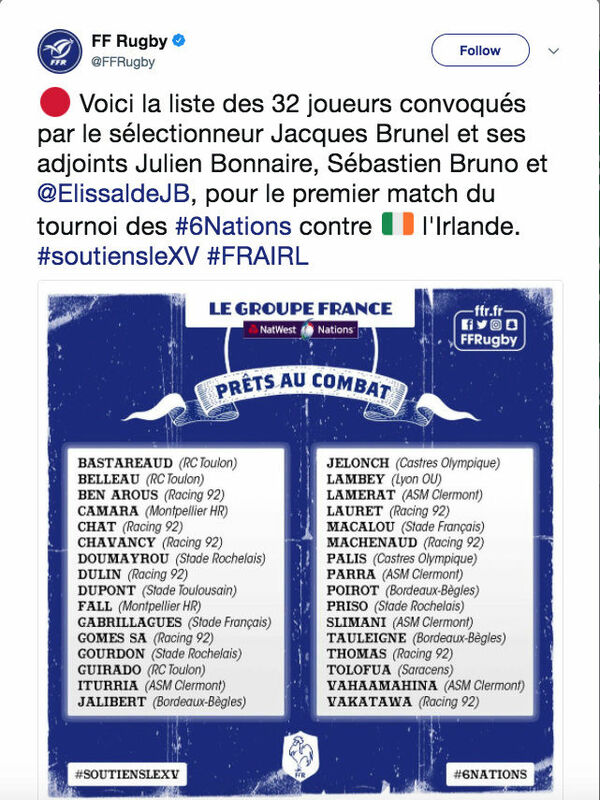 Good to see some of the younger forwards like Macalou and Tauleigne getting a look in. I suspect a large part of the problem under Noves, apart from a lack of structure in attack was picking a big but not very mobile pack. For instance, Atonio provided massive bulk but little dynamism, and also wasn't a great scrummager. Brunel has overseen a Bordeaux pack that is strong but mobile, producing quick ball for an exciting set of backs to exploit. If, and it is a big if, he can translate that basic blueprint to the national team then they may be able to surprise the bookies and a few neutral observers with their play this year. Du Pont and Jalibert could prove to be the best bench 9 and 10 combo in the championship, allowing France to play positive rugby till the final whistle rather than shutting up shop at 60 minutes and trying to hold on for close but unconvincing wins. You mentioned Ireland first up, insinuating they'd struggle against France - I think that's a strange stance to take. Scotland are disrupted by a few more injuries up front aren't they? Not that I'd bet against Scotland, they should also beat France. France's pack balance and consistency in selection seems to consistently hinder them. They seem to select this huge front 5 who try and out outmuscle every side but lack fitness to do it for long enough in a game. The backrow selection always seems to be players shoehorned in rather than players selected for a style of play. The best thing they could do would be to get a foreign coach imo. Why? A penalty would have been enough IMO. All he did was swear. He did a bit more to be fair. 3 weeks is harsh imo but there seems to be a precedent set now on this kind of thing. All Irish people should be banned from all their jobs for the rest of their lives. We swear (the whole gamut of swear words! All of them.) all the time and in all spheres of life. I remember a funny little story about my mother who is a good age but she wanted a plumber in to do a job and phoned this guy to have a pricing done. Told him what she wanted and asked what it would need and the cost etc. He said it depended on the plumber she employed. He didn't know her, she didn't know him but across the phone line, this professional said "If you get the wrong bollix, the job could be shyte". Ban Ireland... we over love our cursing and swearing. I dont think his intent was to be homophobic. Granted if someone is singling out gay players give him a six week ban. He wasnt though he was reacting to provocation in using a word that straight males often use to insult straight males. When your heart is beating at 180 plus beats per second you do and say stupid things. Its just a word anyway. Giving 6 weeks bans is giving the word too much power in my opinion. Word have meaning. Don't use homophobic language if you don't want people to believe you're a homophobe your actions have consequences. will no doubt revert to the established players if losses continue. a penalty try,a penalty,or nothing. It`s a brave man that will write of any team in the end it may come down to squad depth. Players and coaches dictate results not refs. No 7&1/2 wrote: Word have meaning. Don't use homophobic language if you don't want people to believe you're a homophobe your actions have consequences. Yes some words have more than one meaning and Im not convinced Bastereau meant anything homophobic by what he said. No 7&1/2 wrote: Players and coaches dictate results not refs. That obviously innacurate. Referees also have a lot of influence over the outcome of games particularly tight games. The meaning of it is clear as I doubt he's talking about a food. You can't say it. He got a ban. He deserved one. Don't use racially charged words don't use words with negative connotations related to gay people etc. And it's very rare that a ref has more influence. You could occasionally say atigt call on a red early in the game but again it's the players who put themselves in that position. It is popular to pick out one decision from an 80 min game and use it as an excuse. No 7&1/2 wrote: The meaning of it is clear as I doubt he's talking about a food. You can't say it. He got a ban. He deserved one. Don't use racially charged words don't use words with negative connotations related to gay people etc. Its ludicrous to call what he did homophic when in all probability there were no gay people involved in the incident. Well yeah clearly talking about bite to eat rather than grasping for a word to insult someone. If it's true that he was responding to racist abuse as well...Well clearly he's lost his temper and revealed his true horrible thoughts. If you feel swearing on the pitch demands a penalty as you seemed to suggest from your 1st post on this I'm surprised you defend homophobia. I will be interested to see when someone loses and launches racist abuse against a black player and see if everyone defends it like they do homophobia or the racist abuse Marler directed to lee tbh. No 7&1/2 wrote: Well yeah clearly talking about bite to eat rather than grasping for a word to insult someone. If it's true that he was responding to racist abuse as well...Well clearly he's lost his temper and revealed his true horrible thoughts. If you feel swearing on the pitch demands a penalty as you seemed to suggest from your 1st post on this I'm surprised you defend homophobia. Its not homophobia therefore you are utterly incorrect to claim I would defend homophobia. No 7&1/2 wrote: I will be interested to see when someone loses and launches racist abuse against a black player and see if everyone defends it like they do homophobia or the racist abuse Marler directed to lee tbh. You are talking nonsense. The player Bastereau insulted wasnt gay. The guy Marler abused was from a traveller background. Surely you can see the difference? It's obviously not directed homophobia but the word is....it would be the same if somebody he had used the n word etc etc. There's nothing really to argue about, you can't say these kind of things. How do you know the player he called it wasn't gay? Does that make a difference when it's used as an insult to someone? Look some people are homophobic, basteraud has used a homophobic insult. Some will defend it like yourself. Some will condemn it like myself. We'll clearly not agree on his but I'm very happy that I'm on the right side of the argument on this one with the rugby laws and social laws on my side. I don't if it's directed or not pooly. It's a disgraceful act wither way but I know of gay rugby players and football players who haven't declared it. They tend to be open secrets but of course there will be guys who don't want to come out for fear of this kind of thing and the defence of this kind of thing. No 7&1/2 wrote: How do you know the player he called it wasn't gay? Does that make a difference when it's used as an insult to someone? Look some people are homophobic, basteraud has used a homophobic insult. Some will defend it like yourself. Some will condemn it like myself. We'll clearly not agree on his but I'm very happy that I'm on the right side of the argument on this one with the rugby laws and social laws on my side. You are the one claiming the incident was homophobic. Surely the onus is on you to prove he was gay. If not there is about a 1 in 10 chance he was gay so its quite unlikely. Sgt_Pooly wrote: It's obviously not directed homophobia but the word is....it would be the same if somebody he had used the n word etc etc. Not really. People generally only use the n word to be racist. What Bastereau said is commonly used as an insult amongst straight males. Quite. I'm happy not to be defending homophobia anyway. No 7&1/2 wrote: Quite. I'm happy not to be defending homophobia anyway. Even if he was caught admitted and apologised. Move on collapse I'm not going to agree with homphohic comments and any of that rubbish. World rugby came out in defense of getting rid of this from the game very publically back in 2015 so if you don't agree with that stance I don't know what to say to you so that's me done with this on this thread. Youre wrong though. The incident had very little to do with homophobia. I dislike the hang em high absolutist view on these incidents where you are either completely guitly of the worst possible offense or you are not. There is lots of ground in between. IMO Bastereau falls in at the lower end of the scale in terms of being abusive. Lol. No I'm not wrong. You are. Thems the rules. Wr says so. But you're correct in the view of you can argue whether basteraud is himself homphohic or just if he uses homophobic terms for abuse or to rile.hat really is the last boost though. No 7&1/2 wrote: Lol. No I'm not wrong. You are. Thems the rules. Wr says so. Yes. I said the rules are harsh are you agree with them. You are wrong as you are calling this a homophic incident. Thats a real stretch. Ok ok....we get it. As soon as it gets to the "you're wrong, no you're wrong" stage, you know it's time to give up.